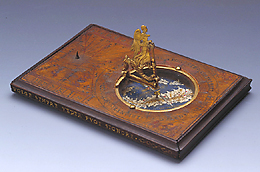 This sundial is engraved on a rectangular wooden base. The compass is complete and has a picture of Italy painted on its base. Above the compass is a wind vane in the shape of an angel. The rim bears the Italian motto 'Loco tempo stagioni fuggir del Hore soffiar de venti ove la calamita si volge sempre veder puoi signore' ('Place, weather and seasons flee from time, blown by the winds, but my Lord can always see where the lodestone points'). The Latin inscription 'dat Planeta diem Horam dat gressus in orbe' is also present. The instrument is not signed, but its characteristic features are comparable to a sundial signed by Camillo della Volpaia.